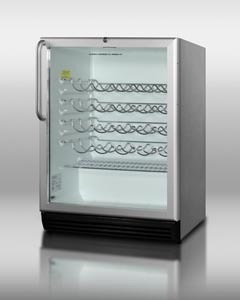 If you own or manage a restaurant, a hotel or a bar a commercial wine cooler refrigerator seems like a good investment. Displaying your wine selection in an attractive wine cooler cabinet will encourage your guests to taste some of the wines with their meals. Apart from being a decoratitve piece of furniture a commercial wine cooler has its practical use, too. It’s ideal for storing wines and keeping your prized bottles at ideal temperature and humidity level. There’re many commercial wine refrigerators available; you only have to decide which one is the most suitable for your needs. Restaurants usually have both red and white wines on their wine list. Whites and reds require different cooling and drinking temperatures. Reds can be enjoyed the best when drunk at 55ºF while recommended drinking temperature for whites is 45ºF – 50ºF. If you plan to keep both red and white wines in the wine cooler then you’ll need a dual zone wine refrigerator. Another factor to consider when searching for a commercial wine cooler is that how many bottles do you plan to keep in it? 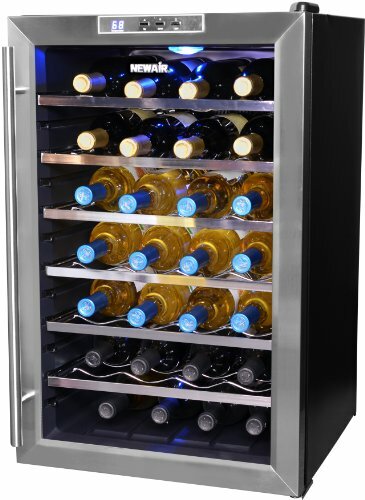 Wine refrigerators vary in capacity from small 6-bottle coolers up to large, professional refrigerators or air-conditioned wine cabinets that can hold 100 or more bottles. If there’s little space in your restaurant or bar then look for a slim or small commercial wine cooler. 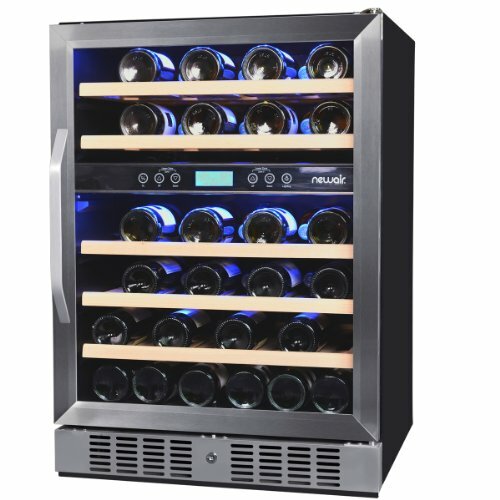 For a larger capacity unit find out about some of the top 100-bottle wine refrigerators that usually have two distinct temperature zones and security lock & key set to keep wines locked away. Another space-economic option is to get a built-in commercial wine cooler or a slim wine cooler designed to fit into narrow spaces. Commercial wine coolers come in a variety of designs and decors (stainless-steel, wooden) so you can match the unit to your restaurant’s or bar’s furnishings. A stainless steel wine cooler exudes professionalism and cool elegance, while a wooden wine cabinet looks highly sophisticated and resembles more like a piece of furniture. Read our Wine Cooler Buying Guide to get further tips and information on factors to consider before purchasing a wine fridge. TIP: The Danby Silhouette 51-bottle wine cellar is an attractively-priced model, with low price-per-bottle cost (US$ 13.98 per bottle). It has a wide temperature range, 45 – 65°F and you can set the temperature with a digital thermostat. Natural beech wood slide-out shelves add elegance to the unit. Silent operation, tinted, stainless steel framed glass door with reversible hinges and lock & key set make this a good-value wine storage unit for commercial use. 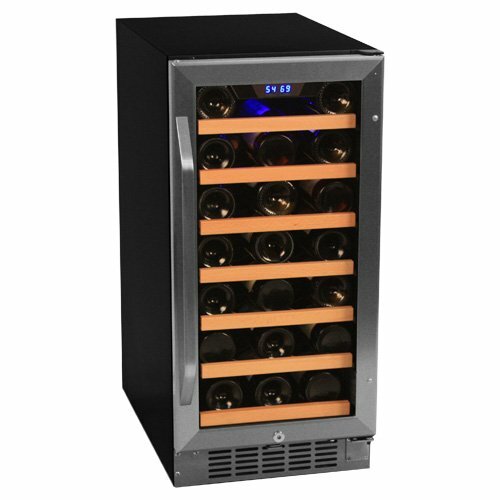 The Danby DWC1534BLS 34-bottle wine cooler is another affordable single-zone unit great for built-in placement. Perlick makes premium quality wine cabinets with stainless steel interior, easy glide full extension shelves and top-of-the-line, industrial quality compressor with variable speed (Signature series). One of their great asset is the efficient, yet utterly quiet compressor. RAPID cool system with front ventilation – allows built- in installation: forced air refrigeration generates cool air throughout the cabinet interior. Warranty: 3 years on compressor, 6 on sealed system. 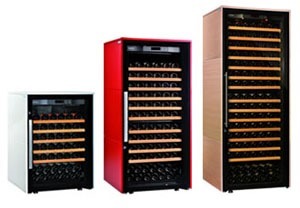 Price of Perlick 45-Bottle wine cooler: depending on door design: $3100 -$3400. Summit Wine Coolers are elegant, good quality products and they have a couple of wine refrigerators designed specifically for commercial use in restaurants and bars. They have a variety of models in the 50-bottle capacity range. Visit our page about Summit wine coolers and Refrigerators. 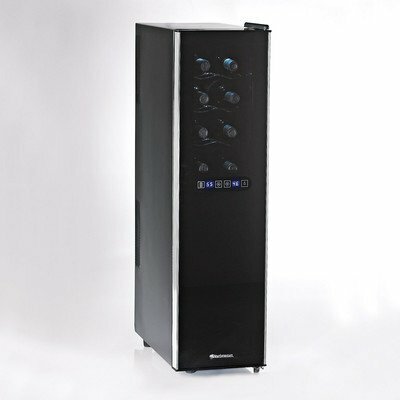 The Allavino 107-Bottle wine cellar is an attarctive, moderately priced capacious cabinet with one temperature zone. It can be placed as freestanding or built-in. The Sub-Zero WS-30 Wine Cooler Refrigerator is a high-quality dual zone unit that can accommodate up to 147 bottles of wine. The Sub Zero 427 Two-Zone wine refrigerator is also a fairly large unit with fine design and many customization options that can be a great choice for any restaurant or bar. If you have larger budget then consider buying a Le Cache wine cabinet which combine highly efficient cooling power with an elegant furniture-like look. Credenza-style wine cabinets are low-height stylish wood storage units available in various storage capacities. The Liebherr WS 14300 3-zone wine cabinet is also a top-quality commercial wine storage unit. TIPS: for a good mid-sized wine cooler unit read our overview of some popular 40-50 bottle wine coolers. See also reviews of other good-value, top-rated large wine coolers. There are so many brands and models to choose from that you can easily get confused. Comparison of major technical features and cost will help you select a wine storage unit most suitable for your needs and budget. 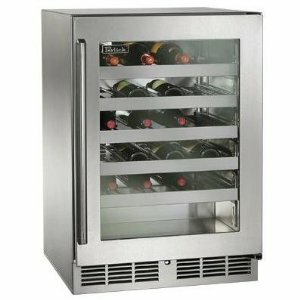 Budget 150-160-Bottle Wine Refigerators – compare 3 popular 150+ bottle wine coolers under $2000. Reviews and ratings of wine coolers reveal both the benefits and weaknesses of products providing you all round information to help you narrow down your choices. All in all a commercial wine cooler is an elegant and practical addition to any restaurant’s or bar’s equipment. If you want an appliance that chills canned beverages then read our review of the GE Monogram Beverage Center. To really get the attention of your guests, place the wine refrigerator in the dining area or in the reception hall. People will see the wine cooler, the bottles attractively arranged in it and get curious and tempted to have a few glasses of wine with their meals. This way your investment in the cooler will be payed off in no time. Best Wine Coolers – introduction and reviews of some of the top-rated wine refrigerators. 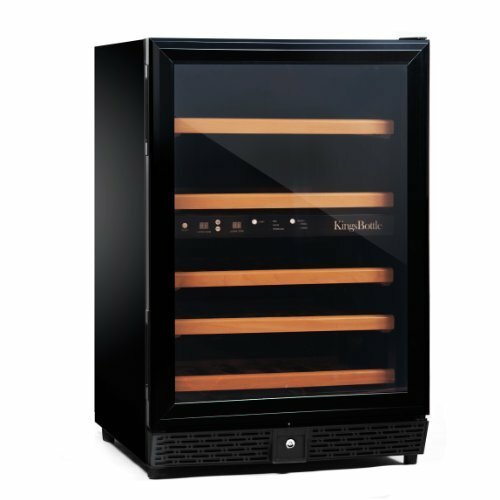 Caple Wine Refrigerators offer quality and affordable wine storage solutions for restaurants and hotel bars.